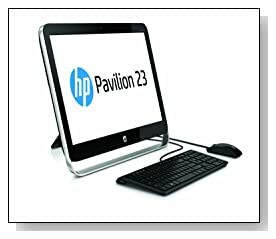 HP Pavilion 23-g010 is a 23 inch All-in-One desktop computer for browsing the internet and streaming videos on its HD widescreen display, listening to songs with superior quality DTS Sound+, word processing, working on spreadsheets and performing any other daily tasks efficiently. It sure has small limitations being an All-in-One but you’re not paying a premium price for it either and it is quite a decent system overall. HP Pavilion 23-g010 comes with an AMD E Series E2-3800 (Kabini) quad core accelerated processor (2MB L2 cache) at 1.3 Ghz to help you work efficiently at improved performance levels (roughly equal to the Sandy-Bridge-based Intel i3-2357M) with also the multitasking power of 4GB PC3-12800 DDR3L SDRAM (1 x 4GB) memory at 1600 MHz that can be upgraded to a maximum of 16GB, 500 GB Serial ATA at 7200 rpm hard drive (about 50% faster read/write times than normal) for adequately spacious storage, free lifetime 25GB of Cloud based Box storage at whatever location there is internet access and the 64-bit version of Microsoft Windows 8.1 operating system preinstalled as a stable platform for any of your tasks from gaming to word processing. 23 inch LED-backlit HD widescreen display with maximum resolution of 1920 x 1080 pixel resolution and AMD Radeon HD 8280 Graphics with as much as 2048MB total graphics memory, for sharp and detailed picture with lush and vibrant colours and IPS technology that gives you great viewing experience from different angles. Built-in stereo speakers and DTS Sound+ technology for immersive sound with high volume and deep bass and the TrueVision HD quality webcam at great 720p resolution that offers superior clarity with built-in microphones for easy and smooth chats with friends and family even in dim light. Black and silver elegant and modern HP Pavilion 23-g010 F3D37AA#ABA weighs just under 16 lbs with measurements of 21.96 x 3.20 x 15.90 inches and doesn’t take up much space on your desk but the keyboard and the mouse are wired unlike many All-in-Ones on the market. Keyboard is chiclet style with Windows 8 hot keys, 10-key numeric keypad on the side and volume control and the optical mouse is comfortable enough. It would have been nice to see a Bluetooth enabled keyboard and mouse but at least you won’t have the problem of running out of and changing batteries and the sleek keyboard/mouse combo is designed for easy navigation of Windows 8. This is an Energy Star qualified system as it consumes less power and meets the guidelines by the US Dept. of Energy and EPA. HP has all the necessary connectivity ports and options covered too: Multiformat DVD±RW/CD-RW drive with double-layer support, 802.11b/g/n integrated 2.4GHz 1x1 high-speed wireless LAN, Bluetooth 4.0 to connect to other wireless devices easily, 10/100/1000Base-T Ethernet LAN with RJ-45, 4 x USB 2.0 ports (at the back), 2 x USB 3.0 ports, 7-in-1 media reader that supports seven formats for trouble-free transfer of digital multimedia files, 2 SODIMM Memory slots (one is available), 1 PCI-E x1 mini socket expansion slot (occupied), 1 x Headphone and Microphone, 1 x Line-out, 1 x DC-in, keyboard and mouse. Conclusion: HP Pavilion 23-g010 is an All-in-One, although convenient to have and use in some ways, it is bound to have small shortcomings. All-in-Ones are generally more expensive than normal desktops but this one is quite affordable at under $500. This model comes with the Windows 8 pre-installed and the screen is not touch but the keyboard/mouse combo are optimised for smooth navigation of Windows 8- which is not the favourite of many but one gets used to it after a while. 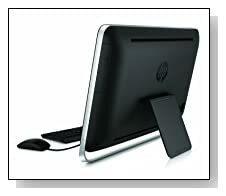 You solve the problem of clutter on your desk or in your room by having a sleek All-in-One that also looks nice. The AMD processor (equivalent of Sandy Bridge Intel i3) performance is satisfactory and the memory and hard drive are more than sufficient for day-to-day tasks. Its main selling point is the HD screen with IPS display and the immersive sound through the stereo speakers and DTS Sound+. You can perhaps get better value for your money if you went for a normal desktop but this one is decent as an All-in-One.